In addition to the horses, we have a number of other animals residing at the sanctuary. These include dogs, cats, chickens, ducks, and geese. Below are listed a few things you may need to know about some of them. 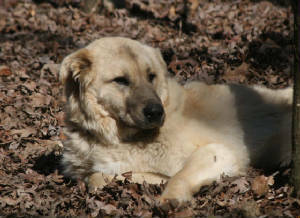 Turk, a neutered male Anatolian Shepherd, is the livestock guard dog. Turk has adopted the paint mare Anasazi and can often be found somewhere in her vicinity. Please do not try to pet Turk until you have become a regular fixture at the sanctuary. No treats, toys or unauthorized food please. Pumpkin is the yellow tabby with the white chest living at the sanctuary. He was rescued when his owner took him to be euthanized for spraying in her house. Dr Lisa Busco could not euthanize the wonderful cat and asked HPS if we would take him and give him a home. Of course we would! Dr Busco neutered him and gave him his vaccinations and brought him to the sanctuary. She continues to help for Pumpkin to this day. Pumpkin likes to climb into open car windows looking for a place to sleep. Please watch out for him. Check inside your vehicle if you have left the trunk or any windows open and underneath your car for them before leaving. 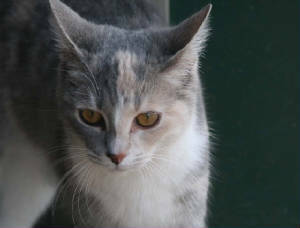 Zuchini, is the dilute calico on the property. She was rescued from Iredell County Animal Shelter in 2011 and helps to rid the property of mice. She is a spayed female. Please do not give her any treats but you are welcome to pet her. 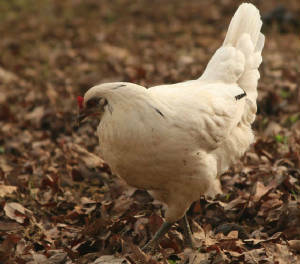 Roosters & Hens: The sanctuary is also the home to many chickens and the occasional duck. Their job is to kill ticks, fleas, and other vermin. They roam free along the premises and lay eggs in some unusual spots. If you find a nest of eggs or a hen setting, please tell Joanie. Do not take the eggs without permission. Occassionally eggs will be placed in the feedroom refridgerator to be shared with HPS members. Help yourself to these. They should be marked with the collection date. Please let her know if you come upon a nesting hen or newly hatched chicks.